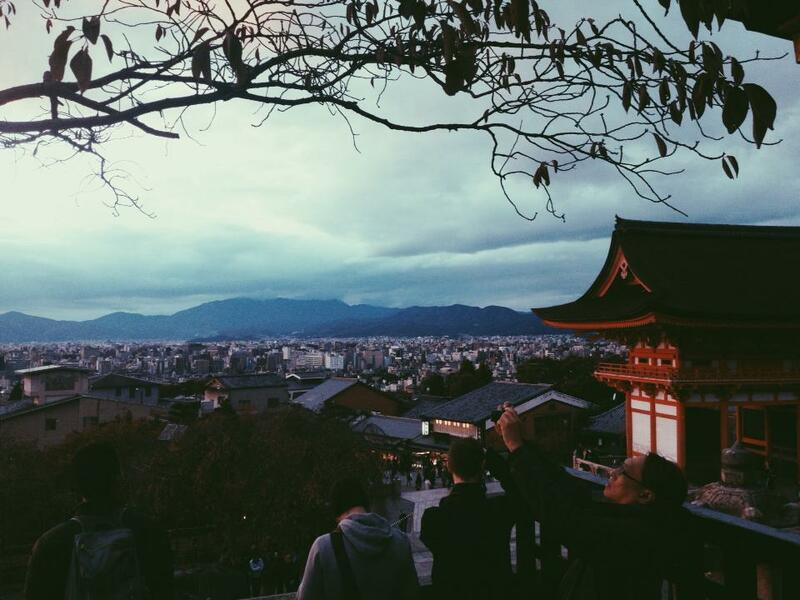 Although Kyoto is a city where you could spend days on end wandering around and still not have explored everything, that's not to say that you cannot see the best the city has to offer with just one day to spare. For those of you who have a tight schedule, we understand that time is of the essence. Below is our self-guided scheduled itinerary of Kyoto to follow and visit some of the city's most famous landmarks and areas. Le Petit Mec: With a wide range of French patisseries and tarts, it is no wonder this bakery is such a hit amongst locals and tourists alike. 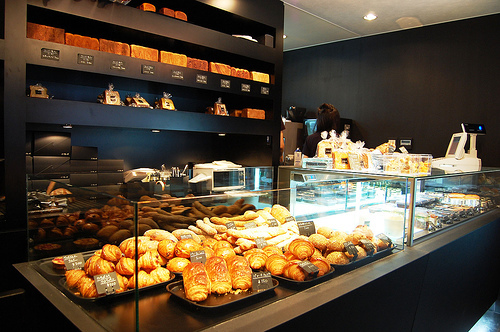 Boulangerie Shinshido: Founded in 1913 by the very first Japanese baker to visit Paris and learn the ways of authentic French baking, Boulangerie Shinshido has branches all throughout Kyoto so it's very likely there will be one close to wherever you start the day. They offer standard Western breakfasts as well if you want to fill up on something more voluminous. Kinmata: If you’re curious about experiencing a traditional Japanese-style breakfast, visit this restaurant. Reservations for breakfast are not required but we recommend you go early anyway. After grabbing breakfast, you should try to be at Kyoto station by 8:45 am to start your self-directed tour by 9:00 am. Directions to our next stop Kiyomizu-dera Temple: From Kyoto Station, take the 100 or 206 bus for 15-20 minutes until you reach Kiyomizu-michi bus stop. Then, walk uphill to reach the temple. 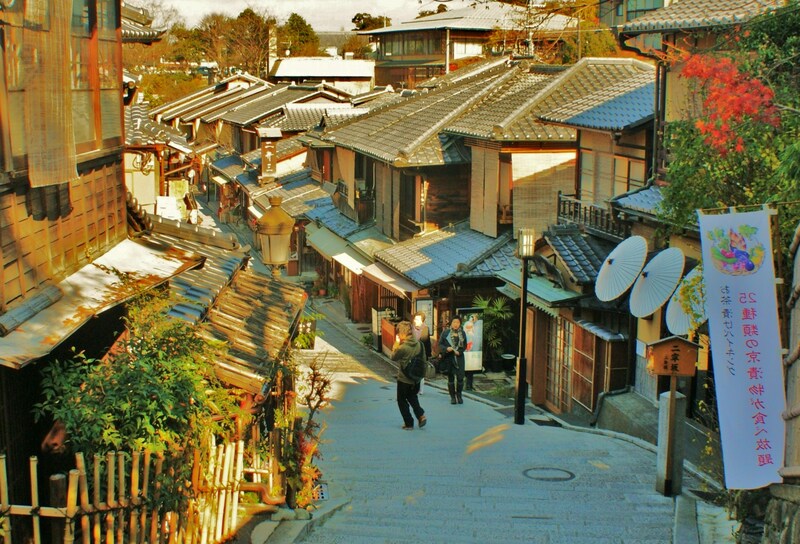 Walk up to the World Heritage Site, Kiyomizu-dera Temple, through the restored neighborhoods of Ninnen-zaka-Sannen-zaka. By visiting the temple this early in the morning, you can enjoy the gorgeous view of the entire city in peace and quiet, as you will likely avoid the flocks of tourists during the afternoon & evening time. Walk back down to the route you arrived at Kiyomizu-dera on (Ninnen-zaka and Sanen-zaka) but now, you should take your time to browse through all the traditional stores and cafés that are lined up along these roads. This is a great opportunity to pick up some gifts for friends and family back home, as these stores sell everything from fans to pottery to traditional sweets. 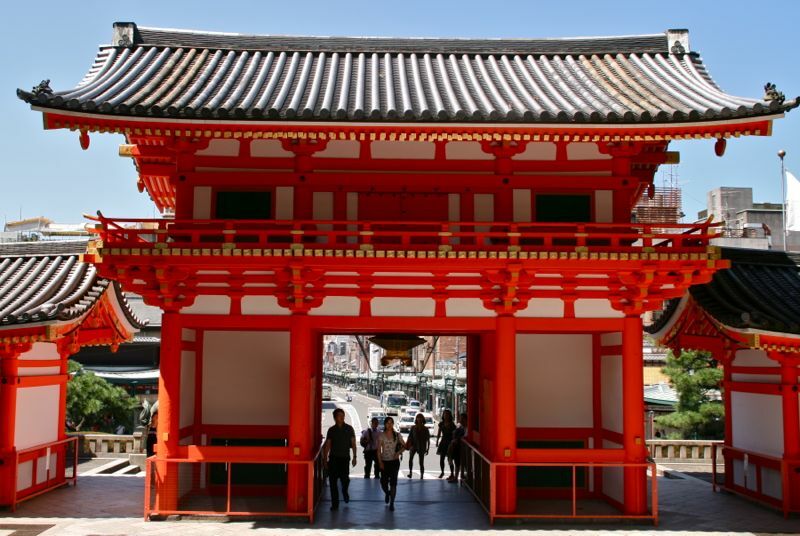 Explore Yasaka-Jinja Shrine (Gion Shrine) and the Maruyama Park adjacent to the shrine. The shrine is known for its festive atmosphere; not only does it host Gion-Matsuri, one of the largest outdoor festivals in all of Japan but on any given day, you will experience the ringing of the brass bells, the prayers of visitors and the chatter of vendors selling all sorts of food and knick-knacks. Although it is an ideal place to visit at any time of year, the neighboring Maruyama Park is especially vibrant during the hanami (cherry blossom viewing) season in late-March to mid-April. Check out our latest blog article about Hanami in Kyoto. Directions: From Kyoto Station, you can take the 100 or 206 bus for 20 minutes and get off at Gion bus stop. Walk to Yasaka Shrine (you will see it once you get off at the bus stop) and the park is located just behind the shrine. If of rang reason you can't see the shrine, walk down Shijo Street until you hit a large road perpendicular to Shijo. It’s lunchtime! We suggest you grab a bite to eat around the famed Nishiki Market to allow for a quick post-lunch stroll around the market area. 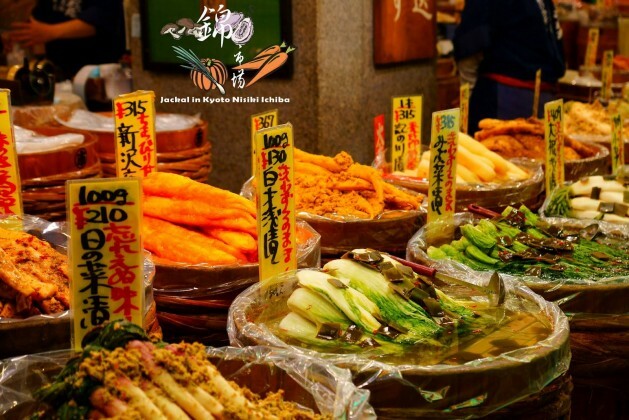 Nishiki Market, also known as “Kyoto’s Kitchen”, has hundreds of stores and stalls selling a range of food-related items such as pickles, traditional sweets, fresh seafood and cookware. We suggest you keep a little room in your stomach to sample the testers and other street food at the market. La Baraka:A 5 min walk from the famous Takashimaya Department Store, La Baraka is a Morroccan restaurant that serves all Halal dishes such as Tagine and Cous-Cous. Lunch sets starting at 1000 yen. Hale: Located conveniently in the Nishiki Market, this small Japanese eatery has set lunch meals for 1000 – 1800 yen. You can sample fresh tofu and steamed seasonal vegetables amongst other savoury dishes. Mumokuteki: This café restaurant serves vegetarian intrepratations of standard Japanese lunch meals, such as Hamburg and Katsu Curry. Set lunch meals with a main meal, rice, miso soup and side dishes starting at 1000 yen. Directions: To get to Nishiki Market from Yasaka Shrine, take Bus 80 towards Shijo-Gion and get off at Kawaramachi stop (around 10 minutes). From here, walk to Fuyacho-dori past Teramachi-dori and walk North. You will find Nishiki Market as you continue walking. You will now want to start heading to Kinkakuji, the Golden Pavilion. It is one of Kyoto’s most famous Zen temples and the structure has two elevated stories covered in gold leaf that overlooks a large pond. Each floor represents a different style of architecture. You can walk through the garden where the temple is located and visit the Sekkatei Teahouse that was built during the Edo Period. Access: You can get to Kinkakuji from Kyoto Station with Kyoto City Bus 101 or 205 and takes around 40 minutes. You can also get there faster by taking the Karasuma Subway Line to Kitaoji Station (15 minutes) and then take a taxi to Kinkakuji (for 900 yen, 10 minutes) or bus 101, 102, 204 or 205 (10 minutes for 220 yen). 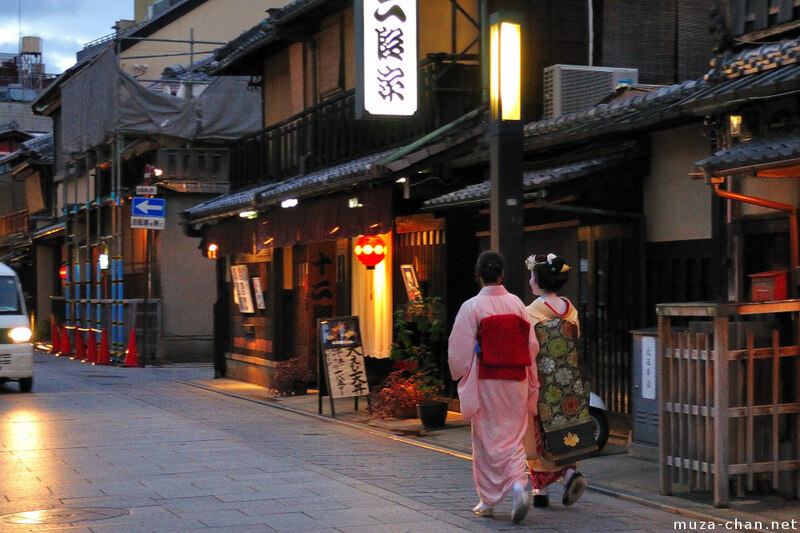 As the daylight slowly starts fading, the night-lights on Gion Street start flickering on. This is the ideal time to take a stroll through Gion, which is famous for its restaurants and ochaya (tea houses) where maiko and geisha entertain. The most famous area in Gion is Hanami-koji Street, from Shijo Street to Kenniji Temple. This area has many old-style machiya (town houses) that were converted into restaurants serving traditional Kyoto style kaiseki-ryouri (haute cuisine) open to the public. Access:From Gion-Shijo station, walk down Shijo street towards Yasaka Shrine on the right hand side of the street. Once you hit Hanamikoji Street (perpendicular to Shijo) and go down this street, you will enter the Gion district. Tousuiro: There are two branches in Kiyamachi and Gion, which makes this restaurant conveniently located next to our last stop in Gion. Tousuiro specializes in Tofu made from 100% domestic soybeans and offers dinner sets that include appetizers, mains, a boiled dish, a deep-fried dish and much more. Vegans can specify their dietary needs and set meals will be adjusted accordingly. Minokichi: This traditional-style Kyoto Cuisine restaurant can serve their dishes without pork, halal-beef and without the use of Japanese sake (alcohol). All of the other ingredients used in the preparation of the dishes are checked to ensure that they do not contain traces of pork or alcohol. You will be able to enjoy dishes such as grilled fish, tilefish shabu shabu and an assortment of tempura (fried shrimp and vegetables). 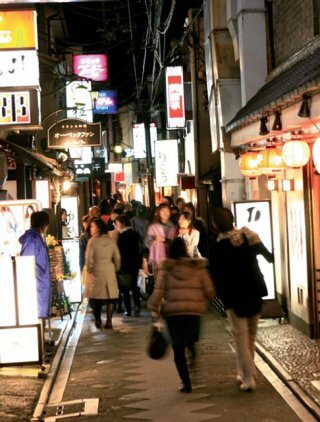 If you still have energy and want to check out the nightlife scene in Kyoto, walk back to where you started your stroll of the Gion Area and find Kiyamachi-dori. This street/area is dotted with tons of bars so check out any one you spot and it’ll most likely already have a festive atmosphere getting underway. Takatoshi was a friendly and knowledgeable tour guide. We had a great 2 days exploring Kyoto. Thank you. We had a wonderful time in Kyoto with Yumiko. I have a bad knee, and she tried to minimize extra walking when possible. She has a very nice personality, and helped us plan our remaining time here.